MLB The Show 18 OSFM rosters are available now. Search for Ridindwnkingsley. (#OSFM V1) It’s time to start your Franchises! UPDATE: OSFM V1.2 is available now with corrections. UPDATE #2: OSFM V1.3 is available now, adding Cease, Stephenson, fixed Cubs LF and more. Make sure you download the ones from Ridindwnkingsley. Original post below, from RidinDwnKingsley. Ok guys it’s that time of year and I have been getting tons of questions so here we go…. As most of you know the OSFM process was started years ago by our good friend Knight. It has evolved and has taken many different processes. Due to changes made within the game and our ability to import and export players it has given us the ability to speed up the way we create this great roster. In the past we would assign each team to individual people and they would turn in their work prior to or right after release. That process worked for some… others not so much. It was great letting everyone do each team but also caused a lot of confusion and chaos as well as ratings being off and diff scales being used. We have changed our process slightly this year but I think when you see the finished product you will all see why. I have been working closely with a team of guys most from OS and some not. These are all guys with a huge passion for our roster and our great game and some are even in minor league organizations and provide insight that proves invaluable. We have already compiled a completely edited roster that is being updated daily with transactions, motion/stance edits, equip edits and much much more. Due to some of the great work done over the last few years the base we have compiled is based on years of work, faces are better than ever. All ages and heights and weights have been adjusted for 2018 version as well. Free agents, missing players and guys we know who have to be created are already done or in the process. So I do wanna thank all of the guys who have put out or edited sets based on OSFM the last few years Showtyme, Willard , Side Effect, WTNY, Aroid, Sammy, Baseball88, BigPoppawilly and everyone who has contributed there are too many to list. The process we have used for this years will eliminate errors and mistakes by up to 50-75% based off past years Versions. So here is how we are gonna do this with this years version….we will release the OSFM “Opening Day Version” around the first week of the MLB 2018 season. Don’t ask what day or what time that’s all your getting….. our goal is to get it out faster and more accurate than ever before and with this process we should be able to. We have a team of guys lined up so once game is released it will be a 24 hr round the clock system of teamwork. You have to realize people have scheduled vacation time and taken days off to be able to do this because of their passion for this so please respect the process and what we do. We will use the new batting stance creator to edit and create stances and have assigned our own person who is reviewing hours and hours of video and taking note upon note so we are ready to dig into that feature. We will accept any work from anyone who has completed teams and incorporate what fits into what we have done. Also once we release the initial opening day version you are all welcome to take that base and add your teams to it or edit it in anyway you want. We will release subsequent versions as the season rolls on as well as always. Please keep the negative comments and complaining to a minimum and be constructive with feedback. Take time to consider the hundreds of hours guys put into this on a year round basis is all I am asking. I usually say this every year because it’s true but this years Version is fat and away the best most complete and accurate Version ever done and will be released probably faster than any set has before. Thanks to Operation Sports for continuing to host this great roster in these forums. If you have any questions or want to contact me to submit players or teams contact me on Twitter. I have updated my twitter handle to @OSFM18Rosters so follow that for updates. I have been at spring training with some of the team and we are getting great info that we are incorporating into the set daily. We also will have some fun things we will do as we get closer so follow us on there for updates. Thank you, thank you, thank you, to all of those involved. Thank YOU as always Ridin! Loved reading this and I have so much appreciation for the hours involved in making it as close to 100% as possible. Also I was very excited to read today that The Show will start with Ohtani in the original roster set from day one! Thank you for your and everyone else's efforts! It does not go unappreciated have enjoyed your guys work over the years. Always adds such an amazing element to the game! Anyone I missed I apologize as so many have contributed. This is a huge team project and not one person does or can do it alone. Thanks to all. Anyway this is great to hear again. and looks like with values added for create players makes copy and pasting easier for you guys! This is awesome news! Thank you to each and every one that puts time into this incredible project. I remember when we would have to wait weeks and months to get the first version. What a long way we have come! How anyone can have anything negative to say about the work done on this roster or the team that works on it is beyond me. Obviously the majority of us here are truly appreciative of the hard work that goes into this. While I’m super stoked for what I’m hearing about this year’s game, this is my favorite piece of news I’ve seen so far!! Thanks again, guys! Looking forward to another great year of video game baseball with the best roster(s) out there! Thanks for all the hard work you guys put in every year. So glad to hear the batting stance creator will be used extensively this year. Thanks for the amazing work to make these fantastic rosters possible. For anyone who has done some freelance face-work or edits, are there certain people we should go to for submitting edits on specific teams? Obviously we don't want people spamming our OSFM team members with work that doesn't fit their guidelines, but I do have some minor league players, faces and equipment edits I'd love to submit if possible. What is the name of the name can tell me please? It is not finished yet. Thanks Ridin (and the rest of your team) for doing these rosters year in and year out. I can't imagine how much work you guys put into this so we can all enjoy a great set. Thanks for all of the hard work! Hey Ridin thank you as always for the great rosters you and your team put out every year. With the new stance creator this year will you guys only be looking to use that with the prospects? Or will you guys be fixing some guys in the majors like Kris Bryant or Bryce Harper for example?? I hope this isn't a dumb question..bear with me as I'm rather new to MLBTS...is this roster going to be available for MLBTS16 for the PS3 as well? No, it won't be. None of the roster creators are on PS3 so it makes no sense whatsoever for them to consider doing that. There is also no backwards compatibility. An MLB 18 roster can't be used on MLB 16. This roster will be only for '18 and PS4. You are going to have a difficult time finding a current roster for both an old title and last gen console. You will need to look deep into the forums for that. Even then, you might not find anything. I, like I’m sure many others, can’t express my gratitude enough for what the “Ridin Team” (for lack ok a better moniker) does with these roster. Every year they are better and come out faster. Anyone who keeps up with full minors for even one team knows the amount of work that has to take place so what these dedicated guys do is mega impressive. Thank you so much. Kudos! Thank you for everything that all of you guys do. If I had the time, I would more than volunteer, but the grownup life just envelops me, so thank you for doing all of this. You guys great! Do you guys use a similar rating scale to the 2017 OS Realism Roster? I found that to be great to really bring out player likeness. Will the opening day roster have all the prospects, or will it be mainly just 40 man with the prospects coming in a later version? OSFM (Operation Sports Full Minors) is always a 90-man roster with all real players. There will never be an OSFM release without real prospects in it. Looking forward to it fellas as always. Thanks so much for all you guys do. Nice to see that you considered my advice of using an universal scale instead of having every creator assigning potentials on their own judgement which created some disparity between teams. Ahead it's a little summary of what i told Ridin in dm and why i came up with the idea. At the bottom is the scale i created (I don't know which one they used). I've offered my help in previous years with no luck so this year I created a formula/scale that will be of great help for all of you, i know each OSFM team is usually created by a different guy and they tend to assign potential by their own judgement instead of using an universal scale so this way every prospect pot is accurately rated when you compare players from different teams and to prevent biased potentials. This way they all will be in the correct order by their rank and scouting grade and you won't see a lot of overrated pot, the #1 in a given year could be the #15 in another year the same way a bad farm #1 prospect could be the #7 in a great farm. For example in 2017 Gleyber finished as the the top prospect with a 65 grade while in 2015 there were a lot of 70 like Seager or Correa and when you have those players besides someone like Gleyber you can see that they are on a different level. The talent pool is not the same every year. It also gives realistics potentials by scouts grades not a bunch of 99 because if you check how the top established players are rated there's only three 99 players (Trout, Altuve, Kershaw) and seven 95+ in the entire league and a ⭐️ like Seager is a 92 OVR as almost a finished product on par with his grade. For example Meadows is wrongly a 95 beast in the game and in real life he has a 55 grade which would give him an 86 pot at best which is accurate to how he has produced and middle of the pack when you compare that 55 with a 70 like Seager that really is a 92-95 OVR. Another example is Chance Adams who was and is the Yanks (elite farm) top pitching prospect and was merely a C in the V1 when he should have been at least a B and that wouldn't had happened with this tool. Some will see their potential decrease while others will rise but those changes will be an improvement to the roster accuracy not by bias. After some research i noticed players 19 or younger that are top 100 tend to make a jump of 10 in their scouting grade the next year etc due to scouts being conservative with unproven high upside prospects until they prove themselves then they give a more aggressive grade which was the case with guys like Amed Rosario, Gleyber Torres and Ronald Acuna among others. They all were ranked low in the top 100 as 19-20 years old (which is impressive for that age) and the next season jumped from 50-55 to 60-65-70 and to the top of the leaderboard. You guys do an amazing job creating thousands of players but i also know it's such a big job and takes so much time that isn't possible for you to go into the details because people expect the roster as soon as possible and i created this formula so it's easier for all of you to rate players and if everyone goes by the same scale/formula the entire roster will be more accurate and will better replicate real life prospects rankings and their expectancy while at the same time you might have better V1 franchises while also helping you or anyone that had to spend time revising and rerating all the players potentials after receiving the players from their creators plus could mean less updates. I hope it will be of great help. I have a few Marlins prospect CAPs that you guys can use that weren't in the most recent OSFM roster. They include Trevor Richards and Jordan Yamamoto...working on a few others as I get time. Any face guys that are available for some work this weekend let me know. We have some touch ups and some reworks to be done on some prospects. Message me on Twitter if you have time this weekend. Thanks guys! It's getting to the point where people are downvoting the OSFM thread a month before the roster comes out, eh? Any of you guys doing that are just sad, sad individuals. Period. game would not be the same without. not even close! Thank you for bringing that to our attention. WTNY knows what kind of work goes into these sets because he has done them. It’s why so many good people have left these forums. It’s been suggested to me that when the rosters are complete to distribute them differently than they have been in the past. I WAS against that. Someone suggested not posting when they are released or releasing under a different name. That’s not what these rosters are intended for but I guess times change and like lots of other things some people ruin things for others. To the people who appreciate the work that’s done and all those who help with this immense project we will let you know how and when rosters will release. This thread in the past has been used to keep the forum updated on our progress as we get towards release but if the community is voting us down maybe we don’t need to do that. It’s a shame because I bet if you ask anyone who has seen the work we have done this year they will tell you the same, far and away better than ever... better every year. So you guys let us know how you want us to proceed and we will let you know what we decide as far as release. Changing the way the rosters are distributed and not updating this thread does nothing but make the trolls who are downvoting this thread happy. Why give in to them? They're just idiots being idiots. I thought it was pretty widely accepted that OSFM are the best rosters of any sports game out there and there are hundreds, if not thousands, of people who look forward to them every year. MLB The Show wouldn't be the same without these roster for many, many people. All the time spent and hard work that goes into making these rosters is certainly appreciated by thousands of people. Anything that becomes popular these days automatically is going to have haters. It's what the internet has become unfortunately. Such a shame that all the work you guys put in is so disrepected. I think I can speak for most of the OS regulars here in saying we are forever grateful for the work, dedication, countless hours put forth to provide this community with something so incredible. I honestly have no idea how I could ever play MLBTS without the OSFM rosters. I'm sure whatever avenue you choose going forward will be the correct decision for the keeping these rosters alive and breathing for many years to come. Again, thank you to EVERYONE putting their time into this project. Look forward to the release! Honestly, I don't even bother with the game until the first OSFM roster is out. I'm sure there are a lot of guys out there in the same boat. I appreciate all you guys do. I know it's a ton of work and you do an AWESOME job! I'm with Rob. Don't change the way you do things, because that's just giving in to what those weirdos want. I think there are faaaar more people that support the roster than hate on it. Can't wait for this year's release! Guys no need for the appreciation comments, trust me we thank and know the guys who do appreciate what we all do.....just know that things will be a little different this year as far as updates we will give and feedback we will take in this thread. Year in and year out this thread becomes a “why isn’t this guy this potential” or “why is this guy rated this” ...not doing that this year.... roster will be released when it’s done and if anyone don’t like ratings or anything else it’s fully editable. We are and have been working on this since last year as a community and have a uniformed rating system and a smaller number of editors to eliminate the “homerism” that has affected some OSFM rosters in the past. Feel free to follow my Twitter as I will post some pics and some random things as well as do some other things that we have been approached about. Wait... are these roster for the show 17 or 18?!?!? Onward, gentlemen. Ignore any unnecessary troll requests. The mere fact that this roster is coming out so quickly should shut up the “can you check and see if Stanton’s shoelaces are white?”, crowd, etc. I spend most my time in mlb the show in offline franchises thanks to the hard work you guys put in. absolutely love them. have for years. i dont even play until your roster drops. Couldn’t agree more or said it any better!! Love each years OS rosters, you guys go above and beyond every year. Now its time for SDS to do the same & make franchise mode able to import as well as export. It's what Art Vandelay would really want for us. Focus on both the importing and the exporting. again with the above & beyond! that is most excellent news. not only for online franchise guys but for anyone who doesn't purchase 18, or anyone who decides they prefer 17 over 18. above & beyond! are you having an affair with Elaine? I see in still having mlb 17 rosters with 18. Tyler Glasnow is much better than you have him too: 78 stamina 70h/9 83 k/9 40 bb/9 60 hr/9 55 clutch 63 control 87 velocity 80 break. He has some nasty stuff. If this seems like good advice email me at and i can get more to you. Those are all SCEA ratings which OSFM does not change. You can also change them yourself. I mean Trevor Williams Started 25 games and had an era a hair over 4 yet hes rated as someone with an era well over 5. No offense, but you can edit them yourself! These guys spend endless hrs making the best roster possible for not only their enjoyment but ours also. But thats like, work, man. They've quit the importing and are focusing on the exporting. And this is causing a problem because, well, why not do both? Sorry if I’m being a noob, but is there anywhere to see player ratings for MLBTS18 yet or do those have to be released via their videos? You'll see final player rating when the game is released. They used to release the "top 10 players at X position" screenshots, but I don't think they do that anymore. Any ratings you see on the streams or videos aren't final. Ratings are some of the last things to be finalized. I see typing in paragraphs is not your thing. Thanks but we have a base roster completed and rated.... feel free to redo it when it’s released but as far as us rerating everything again as far as I’m concerned that’s not happening as we have worked on this base since last year and I def don’t have time to invest in doing that. Like is said earlier feel free to do it yourself and good luck with it! Do you guys make CAPS for prospect that you don't incorporate into the OSFM? Will you be doing with default contracts and/or real version? Thank you all so much for the work you put in. It makes our experience with this game that much better! Wait, so the team is bigger that’s doing this than in years past? And it will come the first week of the season? With batting stances? Man, you guys are killer. We all need to donate beer money for y’all. You guys ever need some help, I'm always ready. I make semi-decent CAP's lol and have been editing my own rosters for a long time now. Let me know and thanks for all the good work. Did I see somewhere Acuna is in 18 as a SCEA player? It's been a while since I played The Show (15).. Do you guys do the contract years/length? I don't expect you guys to do the salary. I forgot you guys take on this. I mentioned in the Franchise stream thread that he was going to be in the game, but I just meant he’ll get added once he makes his debut. It won’t be a face-scan until 2019 or maybe 2020. He is obviously in Spring Training now but I’m not sure if they would have been allowed to scan him this year? I know any new scan they get in ST this year wont be in the game until 2019. Was at about 6 different camps this week alone. Many minor league players have sent me or are sending me equip lists and diff things to add to OSFM so this will be probably the most detailed we have ever released. Did you get to Phillies camp man? The yearly release of the OSFM roster is the only reason I buy MLB The Show every year. It is by far the best roster of any sports game I have ever played. Thank you guys for your hard work every year! Ok guys we are getting close to the early release and we are gonna ask for some small help. I will open a diff thread where if anyone can post pics or names of players who use Mizuno and All Star gloves etc. Basically the new equip.... you can post MLB guys but really looking for prospects as well. First off, thank you to everyone for tackling such a massive job. Secondly, please forgive me for I am very much a novice at gaming, but I love the MLB The Show -- it's the only game I play on my PS4 -- however, I don't know a thing about how to download and implement so that I can play with your rosters ... I love running the Cubs in Franchise mode, and am taking the day off Friday just to grab the game from my local Best Buy and play all day long -- but can someone teach me how to download and implement your rosters when they are completed? Sure. When you get the game, turn it on. In the main menu screen, navigate over to "Vaults." Click on that and select "Roster Vault." Search for anything uploaded by Ridindwnkingsley. Download it and save the roster to your machine. Then make sure to go to load the roster file before you start playing any games/modes. They may have changed some of the placement of these things since last year's game so I don't want to get too specific for you. Thanks for that! See that’s more of what this place use to be about, everyone helping each other out and helping us all get the most of of this great game. WTNY thanks again! Sony should be so lucky. You guys are savages. Haven’t played the series in 3/4 years, and I still remember what amazing sets were put out then. Can’t wait to see these bad boys, and a MAJOR thank you. Projects like this are what has kept me around OS. Probably the latter.... basically a roster update for 2017 with lots of new players.... the priority is 18 so I don’t wanna take any resources away from 18. Thank you, thank you and thank you!!!! I truly appreciate your help!!! Can't wait until the 18 rosters are ready sometime next week -- as I said before, I love playing the Show, and now I'll be able to really enjoy it by getting the max! There isn't an ETA on the 18 rosters though, so you will have to stay tuned to see when they'll become available. They usually announce it both on Twitter and on here. They are usually pretty quick about it, but it could still take some time for the roster to become available. Tommy Joseph claimed by the Rangers. Eliezer Alvarez traded to the Rangers for cash. Bought a PS4 today just for this game, and this roster. Ridin: Interesting that the pitchers wanted their arsenal correct. OSFM 18 will not have pitch edits correct? Or just the prospects? I figure I don't need to wait two months for a re-rate roster but pitch edits would be nice. Either way, looking forward to the roster. I agree that playing the stock version is just not worth it. Thanks very much for the hard work! I did a quick search and didn't see it mentioned, if it was forgive me. Ridin, will this be a 25 or a 40 man roster? Its for every player in the minor leagues that isnt in the game. They dont touch major league players. Ridin, guy who has a copy on Reddit said Arrieta isn't on the Phillies at launch. Will need to be added. The original is released as a 40-man, and then someone usually makes a 25-man roster within a day or two afterward. Only minor leaguers are touched. Then in a month or two into the season, another group uses OSFM as a base to create the correct arsenals for each pitcher. Hope that helps! I realize that. That doesn't answer my question of whether its a 25 man or 40 man version. In past years, sometimes they release OSFM with players only on the 25 man roster and every one else in the minors are not on the 40. Other years they release it with accurate 40 man rosters. 25 man only: allows them to set real lineups without the cpu logic messing up who actually makes the cut for the opening day roster; disadvantage is, because no one else is on the 40, it can effect callups. 40 man roster: Callups are going to be better, but the opening day lineups will be off since who gets cut is dependent on CPU logic, unless you control every team. I personally prefer the 40 man roster version, but I know this gets debated every year. Riding this is why you guys are the best at what you do because it should always be about quality......for that we are thankful for you guys. Why would anyone have been thinking it might be out tonight? That’s insane. ill just sit here and wait patiently for the best roster and only reason for purchasing the game. thank you guys again so much for all the hard work you do. I have so much fun with offline franchises and this roster just amplifies the experience. Just want to add my appreciation for the guys that have been banging these rosters out for years. I have used OSFM since MLB 13. Just wanted to say thank you to everyone who works on the rosters every year, and those who even take time off work to do so. Thank you for making The Show an incredible, and more importantly, ACCURATE experience every season. I think there are people in this forum that don’t fully understand what the OSFM rosters are or how they are created. They have become such a huge part of this game that it would be easy for a n00b to assume that the Roster Makers are part of Sony and/or OS and that they are being paid for their work (and that they have access to the game pre-release). Players hit free agency after they hit 6 years of service time. To delay the 6th year of service time, teams can send players to the minors for about 4-5 weeks to gain an additional year of the player. When Baby Vlad or Bichette are ready the Jays will probably do this. I think I've heard the cut off is around April 21 for this year, but you may want to wait until May 1 to be safe. Someone else may be able to correct me on that. Hope that helps. Ridin bud... Dont know if you're aware or not... But we cant add/remove face shields from players. May want to wait for 1st roster update to see if they add them to guys? It’s April 15 or 16. I think it’s 172 days on the MLB roster so take the last day of the regular season and count backwards. Fully expecting for Ronald Acuna to be in Atlanta for their home game on April 17. But playing devil's advocate, it is far simpler to go in to the 40 man roster and cut it down to 25 (10 minutes) rather than having to look-up 40 man rosters online and search for the guys in the roster to make the adjustment (easily an hour). BUT....I don't know how much added time setting a 40 man would add to your process....so, if doing it as a 25 is easier....that's groovy too. So I guess I should wait to create another RTTS. I tried using current rosters and some top prospects weren’t inported. I’ll judt continue the ones I played in 17. Or I could make it in 17 using the offseason update 9 then after the showcase move him to 18. What should I do? Totally agree here. I much prefer OSFM when it releases as a 40 man roster as opposed to 25. But honestly, it's a small point, because no matter which one they chose, someone will create the other version for download shortly after release. Exactly this. Not just lineups jumbled but But the whole roster is jumbled if I'm not mistaken. The point isn't really "what's better, 25-man or 40-man?" You guys will all never agree on that; there are pros and cons to each. The point is "what's the least amount of work in converting one option to the other?" Most of the time, OSFM releases as a 40-man set because it is frighteningly easy for people to go up and down the rosters and click on everyone not marked as "MLB" and click "remove from 40-man" if they want to get through the preseason without having their lineups altered. Or to just reset the lineups. If it releases as a 25-man set, then everyone is asking for a list of players they need to add back to the 40-man roster. Someone has to make that list, then you guys all still have to add them back. So, 6 of these? Or half-dozen of those? It's really not a big issue and whatever choice is made, the other version will be created within about 2 hours by someone on OS anyway. Its not too hard to create 40 man rosters off the 25 man roster release. And that's why you guys are the best! Don't always settle borderline ridiculous arguments, but this post I wish I could like a few times. My bad. I thought that is what I read on the first comment of the thread. I’m patient. I was lucky to stumble on thread three years ago and I have a deeper love for this game because of what y’all do. No impatience from me... just excitement, like I’m sure all of us do. Are you gonna use the default roster or the roster update today as the base? I don't know how many players got upgrades/downgrades, but Ohtani got a big downgrade in the new update. I'm interested in helping out. Let me know who needs done. As most of you know the OSFM process was started years ago by our good friend Knight. It has evolved and has taken many different processes. Due to changes made within the game and our ability to import and export players it has given us the ability to speed up the way we create this great roster. In the past we would assign each team to individual people and they would turn in their work prior to or right after release. That process worked for some... others not so much. It was great letting everyone do each team but also caused a lot of confusion and chaos as well as ratings being off and diff scales being used. We have changed our process slightly this year but I think when you see the finished product you will all see why. 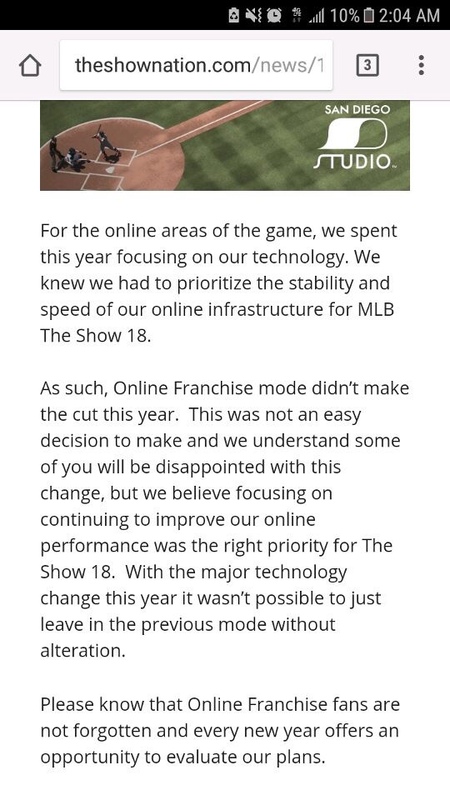 So here is how we are gonna do this with this years version....we will release the OSFM “Opening Day Version” around the first week of the MLB 2018 season .Don’t ask what day or what time that’s all your getting..... our goal is to get it out faster and more accurate than ever before and with this process we should be able to. We have a team of guys lined up so once game is released it will be a 24 hr round the clock system of teamwork. You have to realize people have scheduled vacation time and taken days off to be able to do this because of their passion for this so please respect the process and what we do. I just want to thank you guys for the tireless work you put in every year on these rosters. I found them by chance by someone on a Message board that up until today existed but went away without warning and was posting there ever since, I think I started using your rosters in 08 or something? It's been a long time and I can't play MLB The Show without them. I've for the last few yrs started a Road To The Show just for fun while I wait for your rosters and then use your Rosters for my serious RTS. I use to do a full all MLB team season where I made the rosters as realistic as I could with player moves and everyday transactions but given the amount of time it took and now my changed work schedule and semi promotion (For the better) I can no longer do that. I will be playing a Full season this year though. I'm a big Phillies fan in Philly too so it's pretty sweat to see another Phillies fan be doing these rosters every year. Also not sure if any of your team lives in the North East or how they get their games but if they still get a physical copy I didn't pre order mine until yesterday and the guy at GameStop told me there were no midnight releases do to the Nor'Eastern we just had delayed everything. So most stores didn't get their games up here until this morning. I figured I'd point that out for everyone that if some of these guys do get the physical copy and live in the Northeast they couldn't get their copy at Midnight last night and work relentlessly through the night like others. So please be patient as that isn't something these guys can control. I won't be that guy and I hate when people ask you for an ETA of the game. I did enjoy the progress report the guy (I can't remember his name now) who use to be in charge of this made like 60% rosters complete with an ETA date. My only question on the rosters being out is what's the quickest way to see when these come out? Your social media or on here? Again TY guys for everything. You good with faces? Ridin put Craig Gentry and Alex Presley in the vault if you want to give them a shot. Every guy you need done, just let me know and I'll have it done as quickly as possible. I'm available for anything. I've edit entire rosters before finding out about all this. I did a lot of faces too for nba2k draft classes. And I have nothing but time. All day every day availability. I couldn't wait to get my RTTS going. The past few months have been bad enough. I was set on waiting but discovered a workaround to get accurate rosters into 18 for RTTS. I assume it could work for franchise mode as well. What I did was start a new RTTS in MLBTS 17 using the 'OSFM Offseason Update 9' rosters. I uploaded the rosters into the new RTTS, created my character, and then did the quick tryouts mini game before telling my adviser I wanted to play the showcase games. Then I saved the game and opened up MLBTS 18 and imported the MLBTS 17 RTTS file. The game asks you which player type you want for 18 and then it's time for showcase games! I'm sitting in the locker room now with a perfect imported version of my character, full rosters, and I'm about to play showcase game 1 and get started!! Let me know if there's anyone that you need worked on. I'll be glad to do some faces, thanks! Gentry done. Take a look. Used his 2-20-18 team photo. If u like I'll do the other one. Brett Barrett on the ROYALS is a youtuber. Alex Presley has been reuploaded with a face. Okay man I'll check him out. Ridin, Phillies released Francisco Rodriguez today. Just a heads up for roster guys. Make sure you keep saying your work. The roster glitch is back. Was this the glitch from last year where you'd upload a roster to the vault but it couldn't be downloaded? maybe I can help with the faces ,I have uploaded some players already ,you could take a look of my work ,I have hundreds of players done .my psn username is nena0607 . please check it out . it would be an honor for me ,to be a part of the team . I'll take a look when i get home. I did see your faces in the vault. They looked good from what I can tell. That was real annoying, I always thought the roster was good to use and then it wouldn't save. I figured they would have fixed the issue this year unless SDS is unaware it exists which I can't imagine is the case. I am going to keep uploading all my players , hopefully you could use some of them . I appreciate the time you took to see my work . you just let me know on how can I help ,thank you . Lonnng timer here. Great job done by all of you, great to see that Knights work was picked up by a great team and you’ve truly been running with it. A lot of you newbies out there don’t remember the good ole days of waiting till nearly June for release, then all the versions would trickle out subsequently (equip, faces, pitches, rerates). Thanks a ton. What glitch? I here people talk about a roster glitch but i dont think I've ever experienced it. Guys, FWIW, I simmed Blake Swihart with proper games/service time G AB R H HR RBI SB AVG and carried him into 2018. NOT my face work, and I apologize to whomever did the work last year...I got him from the vault. This is with 2018 default ratings, and spring training equipment, with a Marucci bat instead of Victus. I am not seeing the 'trick' where stats for Swihart were proper when importing a player from the vault over top of the stock player, so I simmed as close as I could get. Thanks to whomever did this excellent facework last year. Sorry again, not trying to take credit. I only did the simming to get the service/stats, and updated the equipment. First time uploading so hopefully I did it right. Ridin... I see Brandon Woodruff of Brewers is in the game but as a editable player... Do you know if his face was worked on? Looks nothing like him. And Taylor Williams? Another editable player. Guys as Showtyme has stated the roster glitch is back and has affected our roster for now. If anyone has contacts at SCEA I would reach out because as we get deeper into the process this could affect release of the roster. The roster is able to be uploaded to the vault but not downloaded by anyone and no one can figure out why. We are still moving on with the process but it may take more time unless this gets fixed. What a bummer to hear this glitch is still present. Hoping SCEA can resolve this! Oh crap! I hoped that would be gone this year! My goodness, this is just unacceptable. SCEA please fix this!! Phillies selected contract of Drew Hutchison and designated Cameron Rupp for assignment. Ok I was only trying to help. What roster did u use as your base? Just an FYI, I saw a Gleyber Torres CAP in the vault by a Nena0607 that is STELLAR. I'm reaching out to them on the PSN to see if they're going to make anymore caps. I'm sorry but to be perfectly honest how could SCEA not fix this for 18? I mean they knew about this problem for 17. Didn't ever fix it or didn't figure out how to fix it. You would think a solid game with such a great team of developers would figure this out & especially not for it to be in the release of 18. I really am in total shock that SCEA could allow this issue to continue. Now, the next big question is can they fix it period? That's either with or without a patch. We know there's going to be at least one game patch but will this specific issue even be addressed? It makes you really wonder what the heck is going on because this is a MAJOR problem for such a great game. Just unacceptable & even more unbelievable to me. :confused: Thanks. Kingery signed a 6 year extension and has made the 25 man roster! The issue was prevalent last year and wasn't fixed. Clearly it won't be fixed this year either. Good idea to start with a new file. Trying to find the issue causing is like a needle in a haystack. I can't even imagine how losing ALL that work makes you guys feel. I'd be so fired up, it wouldn't even be funny. Considering it didn't get fixed last year, I highly doubt they'll allocate resources just to solve this issue. Hope I'm wrong though. But considering the contributions you have made for this game, they absolutely need to make this a priority! They probably should cause if they don't there won't be an OSFM. Showtyme is 100% right. Last year the bug popped up after the initial versions were out. We have spent 30 plus hours by 2-3 different people so over 100 hrs of work.... gone. I did report it to Shownation and on on twitter. Be respectful and constructive but anyone that has encountered this bug I would highly suggest you report it and or if you have contacts at SCEA see if they can look into it. I’m hoping some of the guys here at OS with contacts can help us. But the bottom line is if this new file gets corrupted after all this work then there will be no OSFM and that my friends would be a sad day. Imagine how this game would suffer without OSFM rosters. It would definitely be in their best interests to resolve this bug! Didn't i see something in the forums last year about a player having an issue with years/years remaining being flip flopped....like 2 yrs remaining on a 1 year deal? Was it Thames? I don't have access to the game currently but hopefully someone could do a quick inventory of the roster to see if any of these wonky contracts exist. I did too. Only downside is you're playing a 2017 season in 18. Could it possibly be tied to a specific player that may have been imported around the time of corruption? What team(s) were you working on? It might help narrow down who was imported.